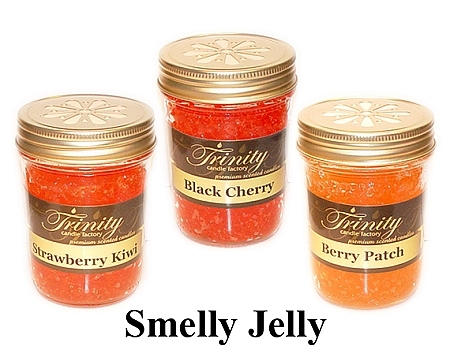 Trinity Candle Factory Premium Scented Leather - Smelly Jelly - 8 oz. Smelly Jelly comes in all fragrances, premium scented for maximum fragrance throw. With a 100+ hours, Simply take out insert and place in desired location. No Flame Needed. This Leather scented fragrance smells like the real deal. If you enjoy the Leather aroma this one is for you. Just an Amazing Fragrance! 100% Satisfaction Guarantee. Not as strong as I expected.